Trinity Candle Factory Premium Scented Christmas Cookies - Tea Light Candle - 8 Pack. 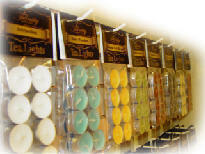 This 8 pack of tea light candles is premium scented for maximum fragrance throw. Burn time 4-8 hours, fits all standard tea light holders. This Christmas Cookie candle smells like oven baked, homemade cookies fresh out of the oven. 100% Satisfaction Guarantee. Christmas Cookies - Fragrance Oil - 1/2 oz.